Kokusai the Genius — Sydney L. Moss Ltd.
vI 220 pages. ; vII 440 pages; vIII 472 pages. 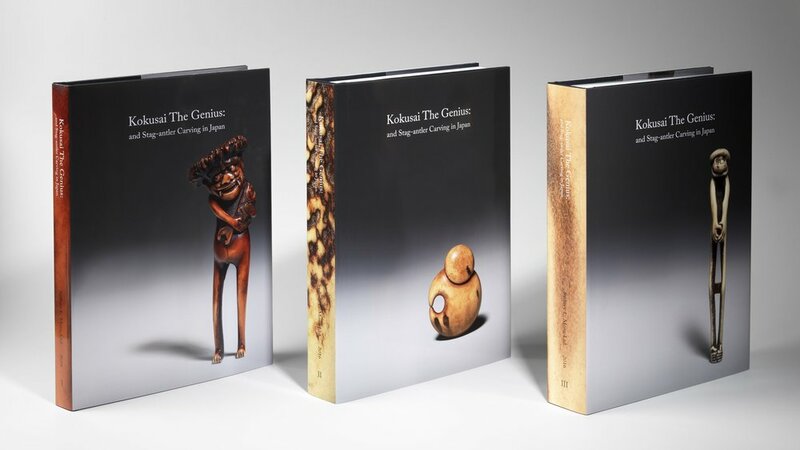 Sydney L. Moss Ltd. presents its long-awaited trilogy of books dealing with the eccentric genius of the Meiji carver Kokusai. Volume I comprises the manifold essays and thematic notes from a range of expert luminaries, going on to cover Japanese carving of stag-antler between the 1700s until Kokusai’s appearance in the mid-19th century. Volume II is the first real survey of a single netsuke carver’s work and gathers together more than 250 works of art by Kokusai, who was not just a carver but a comic raconteur, storyteller, cat dancer, and all-around larger than life personality. Volume III concludes with substantial groupings of works by Kokusai’s followers, including Masayuki, Rensai, Hakusai, and Tōkoku (among many others), ending with Imai Ōshin in the early-mid 20th century. Each of the three volumes includes quite a few unrepeatably brilliant works of art, and no effort or expense has been spared in explicating and reproducing them in the best possible quality. Together this publication represents a must-read for anyone at all interested in netsuke, and is of considerable relevance to those involved in Edo and Meiji period Japanese culture.